Just popping in with a few photos of my front porch progress. I took these photos this evening after dark to give you an idea of how things look at night. The porch doesn’t feel complete just yet; it needs a little greenery around the bottom of the urns and a little something else, but it’s getting there. In years past, I’ve alway hung the garland lower on the door as seen in this photo of the porch decorated for Christmas a few years back. This year I went a good bit higher…which way do you like it best? 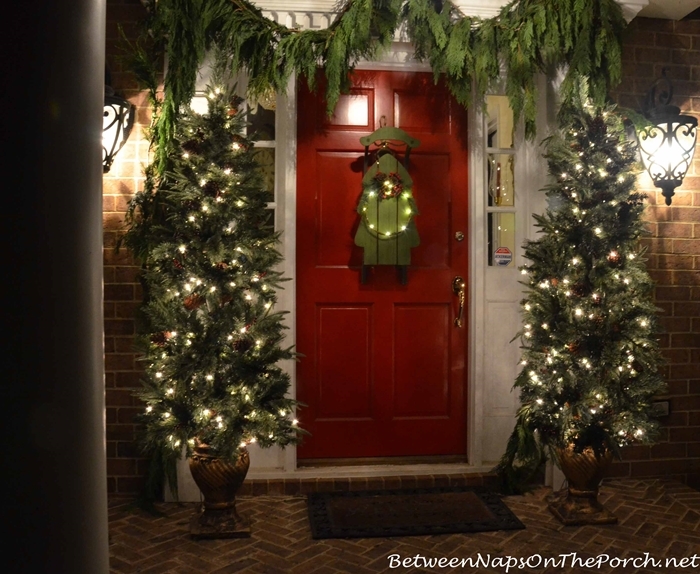 I wish the lit topiaries didn’t hide the garland that hangs down to the floor on either side of the door. I may try moving them over toward the door but then they will probably block the sidelights and kind of crowd out the door. I need a pretty Christmas mat…something simple. I went with fresh cedar garland, just love the way it drapes. I found this little sled in Marshalls a couple of months ago. I love its Christmas tree shape. 🙂 It would make a really great centerpiece for a Christmas buffet table or possibly even in the center of a regular dining table. If used on a buffet table, it would make a cute serving stand for some of the dishes. It always looks nice to place dishes at different heights on a buffet table. Today it’s decorating my door for Christmas. I usually use a wreath and normally it’s a live wreath, but I thought it would be fun to do something a bit different this year. I’ll share another picture later when the porch is more complete. Update: A few folks were wondering if the sled would scratch the door when I open and close it. It came with a jute rope piece for hanging, but I added wire because the jute was really thin. The sled stays in place well as I open and close the door. It’s made of a light weight wood and I placed little soft pads in several places on the back of the runners. I really didn’t need as many as I used because the only part of the sled that actually touches the door is at the very bottom. The little pads I used are from the hardware store and they are similar to the type you put on the bottom of a chair leg, except much, much smaller. I think they’re probably designed to be used on the bottom of a decorative vase or a piece you might want to place on a table, but they work well for items you’re hanging, too. The rope you see hanging above the sled is a little pull rope that came on the sled. I drapped it over another nail that was already in the door that’s normally used when I hang wreaths or baskets. So the sled isn’t really hanging from that nail, the rope is just draped there. I love the sled!! It looks awesome! Pretty as ever and I do prefer the garland hung higher. Thanks, Kathy…I think I do, too! That sled to perfect and i love the garland hung like that,it reminded me of moss when it hangs in trees, how pretty it is. Your front porch is wonderful. Have fun wrapping gifts, specially for your little ones,grandchildren are the best. Thanks so much, Marlene! It reminds me of that, too. That must be why I like the cedar garland so much. I really love how the moss looks hanging in the trees in Charleston and Savannah. I love the sled. Does it bang against the door when you open and close it? Your porch looks amazing, just the way it is. Dee, I just added a few photos to the end of the post showing little pads along the back of the runners. Check that out, they keep it from banging into the door. Like the garland hung higher, love the sled!! I love To decorate too. We have similar tastes. Love your blog. Would love to share some of my photos with you if you ever want to see. We live in house with 40ft covered porch with rockers and swing and 6 columns and dental moulding. I love patience Brewster and fitz and floyd. Anyway…really enjoy your blog. Keep up the good work…..
Nancy, I would love to see your porch…sounds beautiful! Would love to share pics but i am not sure how to send to you on this link….i can do attachments on a regular email and insert photos on a message but being Blog challenged…lol, i have no clue. But…..your porch looks warm and welcoming. We both love lenox winter greetings. I just finished the christmas table today…fitz and floyd bellacara and winter greetings lenox cardinals dishes. Nancy, you can send them to [email protected]. I’d love to see your table, too…sounds beautiful! It is so cute that the sled is shaped like a tree. I first thought you had done that! I have got to decorate my 2 little trees, but need to get the spirit. I did get the put together and figured out the lights! That’s a plus!! I love the sled! I’m a fan of doing things that are just a bit different, but not crazy over the top. This fits the bill. I’m not sure which I like better. I think I like it higher, but it was nice before too. Big help I am :(. lol I think I like it higher, too. I love your porch and the garland looks great hung just the way you have it now! The sled is adorable and is such a nice change from the traditional wreath. I sure do wish we had some of the stores you have!! We are blessed with great stores in the metro Atlanta area especially HomeGoods, TJ Max and Marshalls! Love it all. Did you make the cedar garland? If so, may I ask how? No, I found it in HomeDepot. Lowes normally has it this time of year, too. I think it was $15.99 for 20 feet…something like that. Normally, 2 bunches would be enough to go around the door a couple of times, but I used all three of the rolls I bought since I went higher this year and I like for the garland to look lush, not skimpy. Cedar garland can be a little prickly so you would definitely need to wear gloves if you made your own. I used gloves while hanging it for that reason. Thanks, Susan! I have a barn red door which could probably use a new coat of paint. What is the color that you used? Love the sled idea. It’s Benjamin Moore Heritage Red and they only make that in their Exterior Aura line. Not all BM stores can mix it so be sure and call ahead to find a store in your area that carries the Aura line. It’s a bit pricey but I do love this color for a door. Love, the red door, the garland, the sweet sled, and their trees on the sides, my favorite would have to be the trees. I like the garland high rather than lower. Lower looked fine till you went higher, higher wins in my book. Again, thank you for your posts, we all enjoy them, even when we are silent. Very cute!! I was thinking wrapped boxes would look neat on your porch!?! I am wrapping empty boxes and placing them on my porch bench .Im sure whatever you do will look great as always! I love the sled! It’s such a nice, different way of decorating for the season. You could leave it up after Christmas, too. 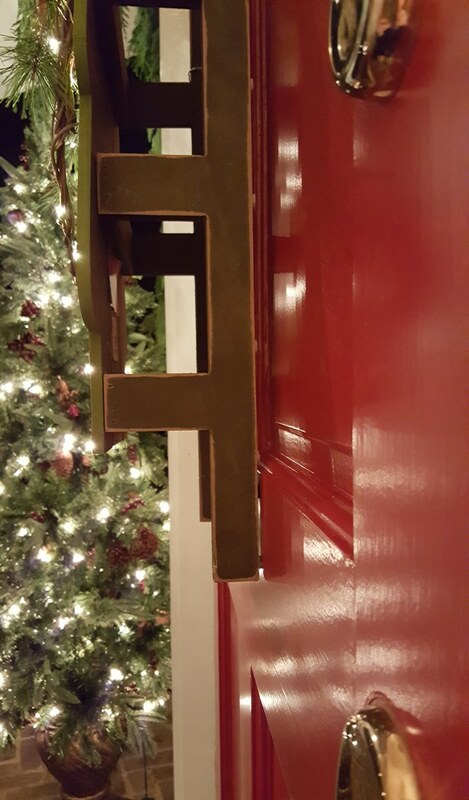 Your red door just sets all the decorations off so well. I would leave it just the way it is. It’s lovely! I love your porch. The sled is so cute. I think your porch looks perfect. I do agree that a new seasonal mat would be just the right touch. You have been a busy girl today. Bravo!!! It looks wonderful! Did you make your garland or did you purchase it? Thanks, Yolie! No, I bought it at Home Depot yesterday. I used 3, 20 foot lengths. Oh, the cruise looked fabulous! Also! Loved the turkey scarf and hat ! Made me laugh! I love your font door. The sled is so cute. 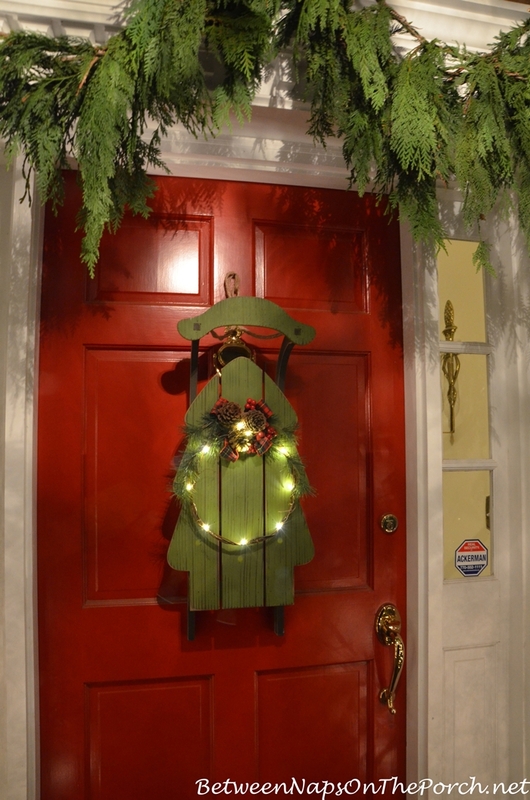 I like the garland hung higher seems to add a bit more presence to the door. Susan, it looks GREAT!!! I like the garland hung higher. Are the two christmas trees in the urns new? I like them too. Thanks, Irene! No, I used those on the porch last year for the very first time. I loved how they looked so brought them back out again for this year. 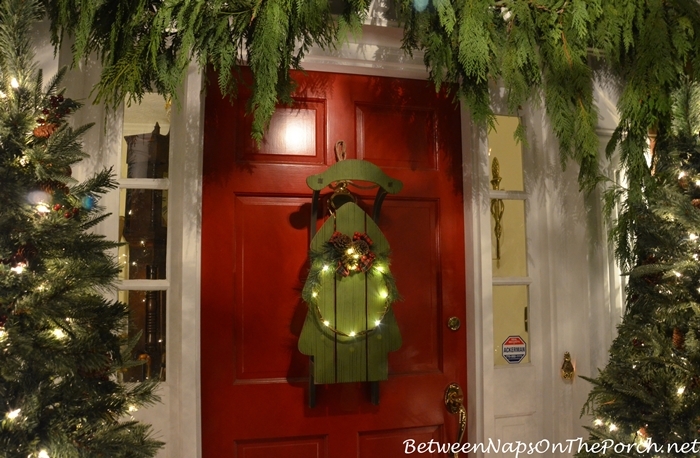 You can see them a bit better in last year’s post here: https://betweennapsontheporch.net/christmas-porch-decorating-ideas/ They may be available again this year. Like the garland hung higher. I have two smaller topiaries at the front of my side walk leading up to the porch and they are lighted as well. Love them. Also have my childhood sled and skates! Have to put the garland around the door this Saturday. The house is 80% done, but still have the mantel and tree to go. Working 10 hours a day just gets in the way – ha- but it does help to purchase our items! lol Can’t wait until retirement! I’m loving the sled on the red door. I really like the garland up higher. Have you thought about putting the lite trees on the other side of your outside lights. Liking the look. Thanks, Deborah! I wish I could but unfortunately the porch doesn’t stretch beyond the lights. 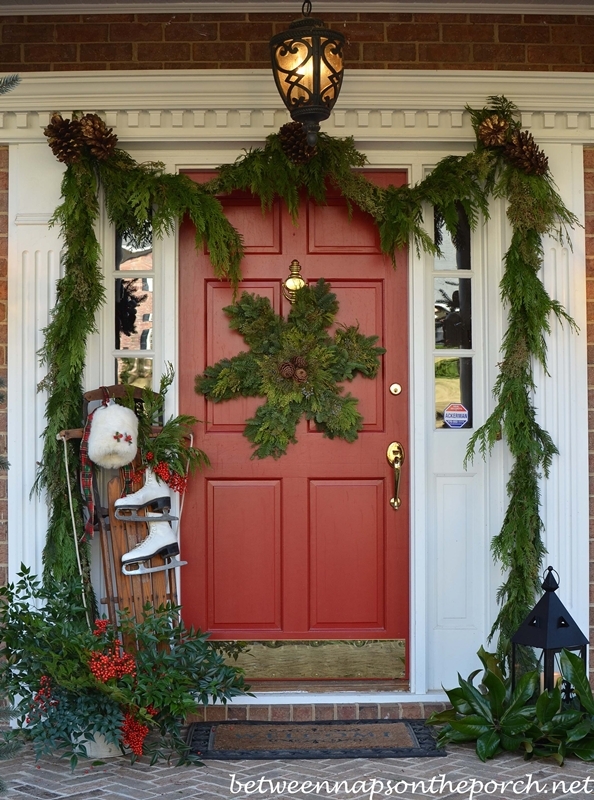 Because of the beautiful red of the door I like the garland up higher. Is there room to move the two topiaries each out toward the side of the porch more? I can’t tell in the picture. It is truly a beautiful display as it is. I would be thrilled to have such a lovely porch. Ours is buried in snow right now! Thanks, Mary! Unfortunately, the lanterns are right at the edge of the porch, so there’s no room beyond those. We’ve been having unusally warm days but I know that will end soon. Packing for our trip to Williamsburg, but just had to stop for a moment to let you know that your front door looks gorgeous! 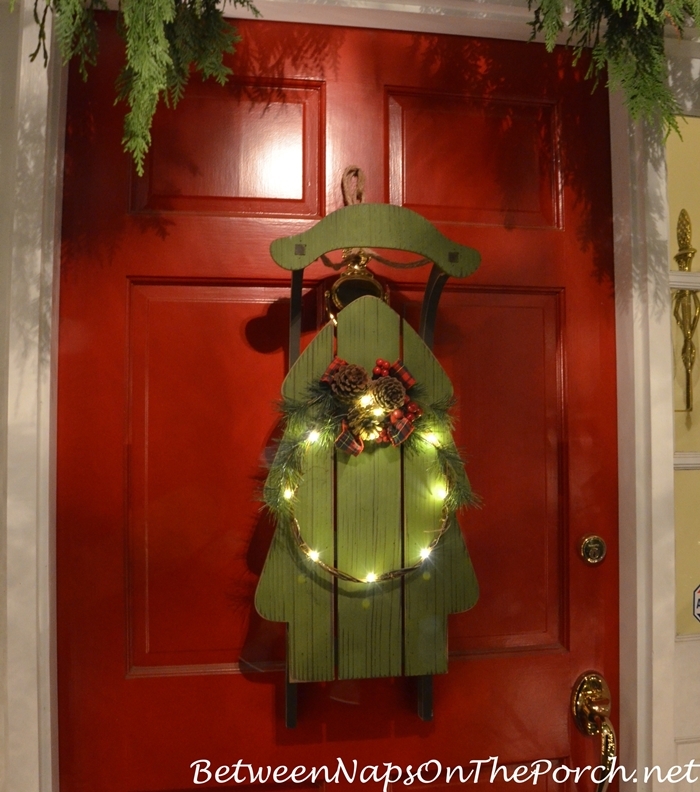 I like the garland hung higher– shows off more of that beautiful red door, too. You ALWAYS decorate everything so perfectly, Susan. Know that your neighbors must love having you in their subdivision. I’ll be away until next week, but I’ll check in to see what all you’ve decorated, which I know will be lovely. Hugs. Love that sweet green sled!! The garland looks great higher. Can you move the 2 trees closer to the 2 columns?? Maybe that would open it up more and you could see the garland on the sides. Very peaceful and nice setting!!! I love the way it looks now. Sort of the “less is more” approach. Especially with all your beautiful wreaths on your windows! 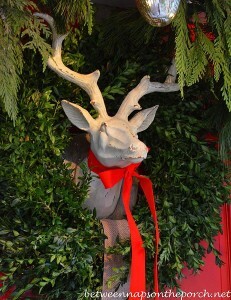 Love fresh greenery during the holidays. The garland looks wonderful. Very pretty and festive. I wouldn’t add a thing. Like the garland hung higher. Really lush and elegant. Great job! Merry Christmas to you, and your family! I love the front porch, like the greenery hung higher, it seems to open up the front porch. I do agree though you do need to find a front door mat with some personality, I believe that would give even more life to your most welcomino space. I love everything, everytime you post. You have such great style. I always come away inspired. This is beautiful! It’s natural and elegant—perfect. I too am looking for a doormat. I’d like something festive but also a mat that I can keep out all winter. Thanks for the inspirations. Your porch looks very nice, love the sled! I think I like the garland hung higher. It’s beginning to look a lot like Christmas! Just finished decorating the house. Now for the presents! oh and cookie baking! 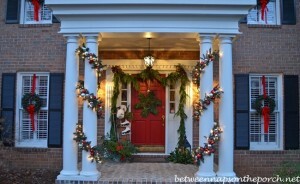 I love the placement of the garland because it doesn’t hide your pretty front door. I’ve bought the little sticky pads at Lowes, which definitely protect the paint. Merry Christmas! The porch looks beautiful, your door is the PERFECT color!!! Love that sled! Are the lights battery operated??? I use those little pads all over the place for stuff:) Hope you find a mat! Thank you. You’ve inspired me. I’m going to put the an old sled my neighbor gave me on my door with some greenery. Beautiful! Love the red color of your door. I love it just the way it is! 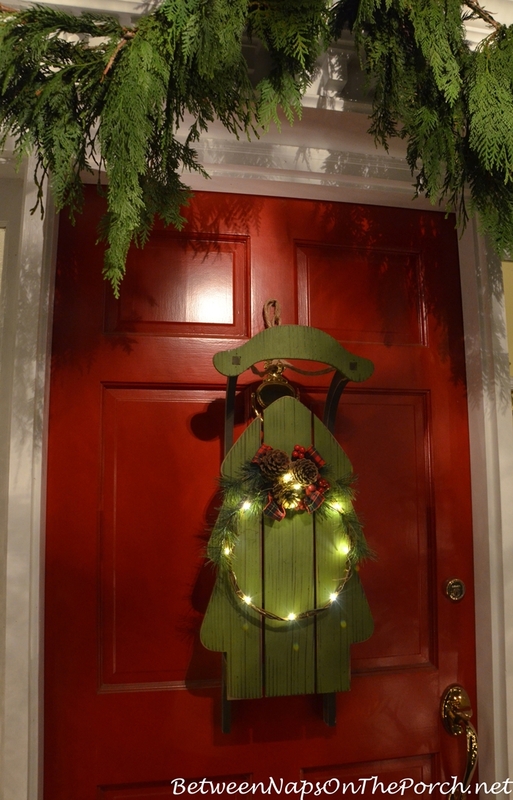 I do like the garland higher up- the other way seemed a bit intrusive of the opening of the door. Love that sled. I would have done exactly the same thing with the little felt pads. If a wind kicked up it could make it slide and scratch. Beautiful…I like the garland higher up best. 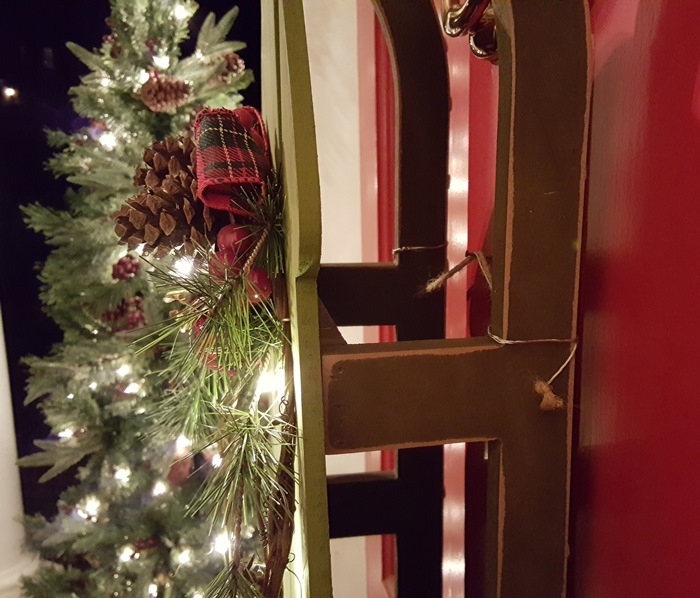 Love the whole door project–the sled is great. While shopping online, check out the pillow I thought you need for your porch. (It’s a bright red so might be too garish–but the thought is cute.) What does it say? Love the garland higher. We’re tall in our clan and getting older, so we like wider openings. 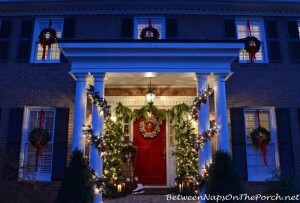 While the pictures might be deceiving, it looks like you have room to shift your topiaries just a bit to snuggle between the sidelights and the porch lights – greenery diffusing the brightness of the porch lights, but bright enough between greenery lighting + interior lights shining out of sidelights. Even a few inches will give the doorway more breathing room. AND, since you LOVE tartan, paint your own doormat – get a large natural brown one (Ikea?) & add reds, white & a bit of green. Slide a few slender live greens beneath the mat so they’re peaking out, & that’ll pull all your colors together without overwhelming the simplicity of your theme. That sounds like a cute idea for Christmas…painting it a tartan pattern. Thanks for that suggestion! I found one to use year around and I’ll be sharing it soon. I really love how it looks. It just came a couple of days ago. I love your tartan idea for Christmas! I like your garland hung higher off of the trim. I used to have a door and trim like that in our previous house. I put my garland across the top of the trim and let it hang down from there. It made my door seen larger and more impressive. Ha! It’s kind of like hanging drapes higher to the ceiling. Ha!